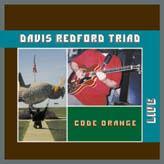 Davis Redford Triad - "Code Orange"
After two studio albums (plus a solo album by guitarist/leader Steve Lobdell, three tracks from which appear here) of music that starts as psychedelic guitar rock and ends up beyond, it's time for a Davis Redford Triad live album, since that's the context in which bands of that ilk (aside from studio-only projects) tend to excel. The recordings here come from (presumably) several (undisclosed) locations from the band's spring 2002 tour with Primordial Undermind, although not, apparently under the titular Homeland Security Alert (which its' release date DID fall under). It's a stylishly sprawling effort, with eastern-tinged psych ala Sun City Girls ("Solar Aquarius"), full-on driving blanga ("Apocalypse Greeting Card"), raging noise improv ("Mellowed For Over 80 Million Years"), all bookmarked with Echoplex and/or Moogerfooger blasts, and also more restrained moments (courtesy of two of the three songs from Lobdell's 'Automatic Writing By The Moon' solo CD, still presented here in considerably thicker forms). Despite the distinct identities of each the eight tracks, they flow together near seamlessly into a well-paced and impressively-edited set. The showstopper/climax is a take on 'Automatic Writing's "All Mystics Are Numbered" which scorches like High Rise, or any other high-energy fuzz/wah rocker of your choice. And, to their credit, after the 'Triad pummel listeners into the ground with that one, they only release their grip on the audience slowly, not letting them off easy, with the shambolically deconstructive denoument of "Blue Cloud". Who needs an encore after that? Needless to say, well-recorded with a talented & flexbile band... one hell of an advertisement for their live show. For ordering information and sound files you can visit: http://www.midheaven.com/labels/holy.mountain.html.